This model leverages a database created in the context of this doctoral work of satellite-derived photovoltaic output spanning 10 years at a daily interval for 64,000 unique geographic points across the globe. Underpinning the model's design and results, the database was used to further the understanding of solar resource variability at timescales greater than 1-day. It is shown that--as at shorter timescales--cloud/weather-induced solar variability decreases with geographic extent and that the geographic extent at which variability is mitigated increases with timescale and is modulated by the prevailing speed of clouds/weather systems. Unpredictable solar variability up to the timescale of 30 days is shown to be mitigated across a geographic extent of only 1500km if that geographic extent is oriented in a north/south bearing. Using technical and economic data reflecting today's real costs for solar generation technology, storage and electric transmission in combination with this model, we determined the minimum cost combination of these solutions to transform the variable output from solar plants into 3 distinct output profiles: A constant output equivalent to a baseload power plant, a well-defined seasonally-variable output with no weather-induced variability and a variable output but one that is 100% predictable on a multi-day ahead basis. 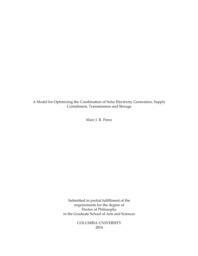 In order to do this, over 14,000 model runs were performed by varying the desired output profile, the amount of energy curtailment, the penetration of solar energy and the geographic region across the continental United States. Despite the cost of supplementary electric transmission, geographic interconnection has the potential to reduce the levelized cost of electricity when meeting any of the studied output profiles by over 65% compared to when only storage is used. Energy curtailment, despite the cost of underutilizing solar energy capacity, has the potential to reduce the total cost of electricity when meeting any of the studied output profiles by over 75% compared to when only storage is used. The three variability mitigation strategies are thankfully not mutually exclusive. When combined at their ideal levels, each of the regions studied saw a reduction in cost of electricity of over 80% compared to when only energy storage is used to meet a specified output profile. When including current costs for solar generation, transmission and energy storage, an optimum configuration can conservatively provide guaranteed baseload power generation with solar across the entire continental United States (equivalent to a nuclear power plant with no down time) for less than $0.19 per kilowatt-hour. If solar is preferentially clustered in the southwest instead of evenly spread throughout the United States, and we adopt future expected costs for solar generation of $1 per watt, optimal model results show that meeting a 100% predictable output target with solar will cost no more than $0.08 per kilowatt-hour.